Brad Paisley is an American country music singer-songwriter. He has released ten studio albums and a Christmas compilation on the Arista Nashville label, with all of his albums certified Gold or higher by the RIAA. He has scored 32 top 10 singles on the US Billboard Country Airplay chart, 19 of which have reached number 1. He set a new record in 2009 for most consecutive singles (ten) reaching the top spot on that chart. Paisley has sold over 11 million albums and won three Grammy Awards, 14 Academy of Country Music Awards, 14 Country Music Association Awards, and two American Music Awards. 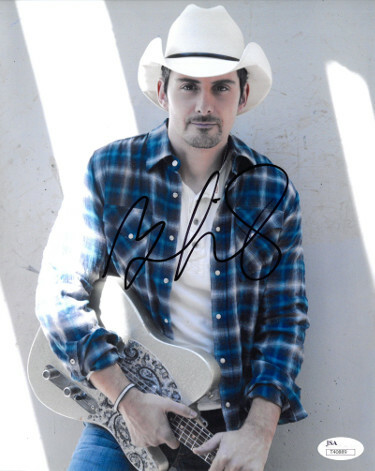 Brad Paisley has hand signed this 8x10 Photo. JSA Hologram #T40889 and Certificate of Authenticity.